If you want to see 14th-century stained glass, a 15th-century pulpit, a 16th-century sarcophagus, 17th-century choir stalls, and the chapel where two of Mozart’s children were baptised, then grab your audioguide and step this way. First and foremost, this is the only way (outside of a guided tour) you can access the main part of the cathedral. Otherwise, you’re left pressing your nose up against the railings among the masses, vainly wishing your smartphone had a longer lens. In fact, by paying you get to enjoy the cathedral in relative quiet. There are 12 stops on the tour, each with 2-3 mins of audio text. It covers the history of the building and provides an array of often intriguing stories and background information on the cathedral and the features inside. Since Stephansdom is not as opulently baroque as many religious buildings in Austria, it’s easy to get a feel for the basic spiritual atmosphere that people would have enjoyed even centuries ago. You can imagine the awe it would have inspired. Buy a ticket and pick up an audioguide from the information counter (middle-left when you enter the cathedral). You need to leave some form of identity (like a driver’s licence) as a deposit. Tell them you want an English-language audioguide and they’ll set it up for you. When I visited, a ticket was €6 for an adult, €2.50 for a child, but if you’re going to visit more than a couple of Stephansdom attractions, get the all-inclusive ticket from the counter or in advance*. At the time of writing, the tour areas open daily…from 9 am to 11.30 am (Monday to Saturday) and from 1 pm to 4.30 pm (all days). Stephansdom is a working cathedral, so the tour is not possible during services. The most reliable times to get in are probably in the afternoons. Check the official website for the latest details on opening times, prices, etc. 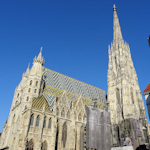 See the main Stephansdom article for travel tips.